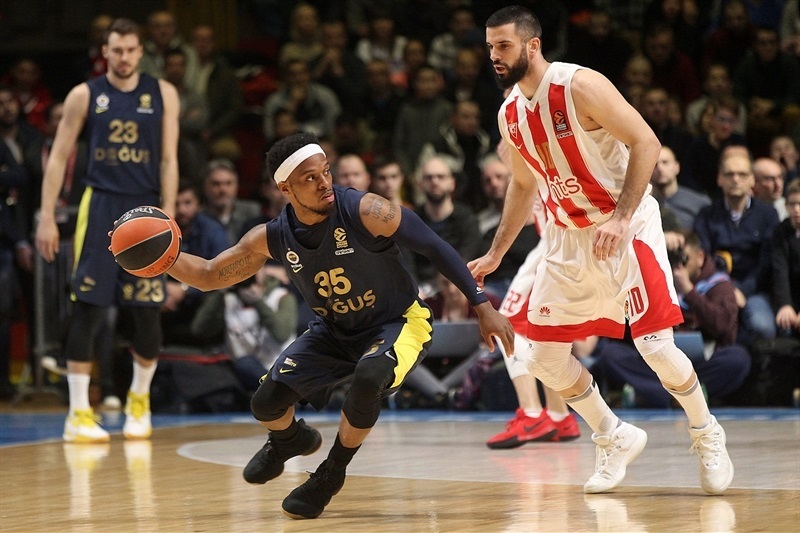 With an impressive long-range shooting display, defending champion Fenerbahce Dogus Istanbul assured itself home-court advantage in the playoffs by running away from host Crvena Zvezda mts Belgrade for a 63-80 victory on Thursday. 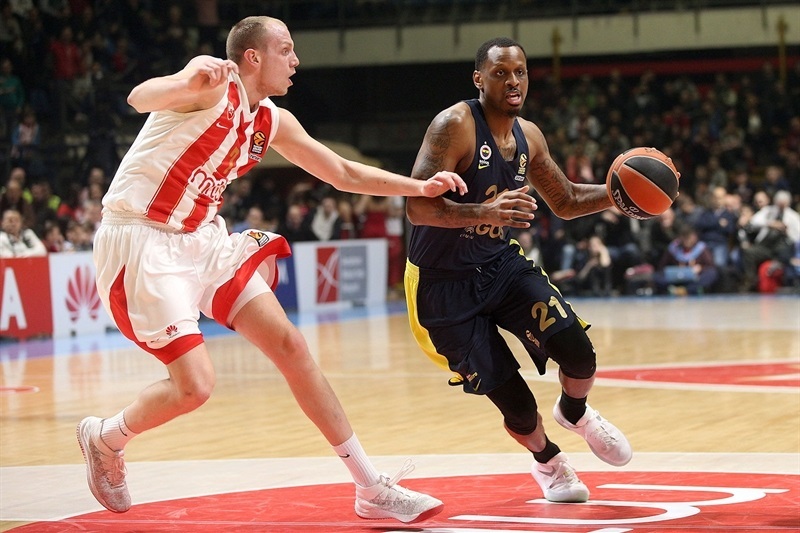 Fenerbahce's 11th win in the last 13 games gave it a 20-8 record to retain hold of second place, while already-eliminated Zvezda dropped to 11-17. 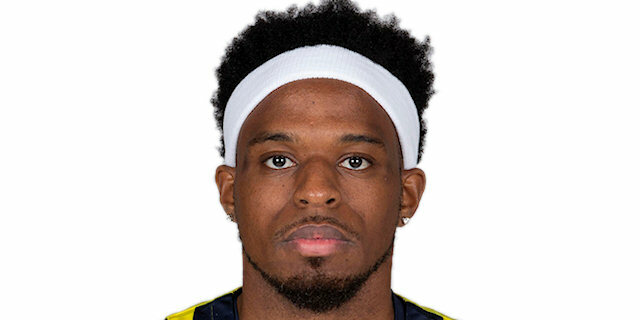 Ali Muhammed pumped in 7 of Fenerbahce's 14 three-pointers – 13 of which came in the first three quarters – on his way to a season-high 25 points, one short of tying his career high. 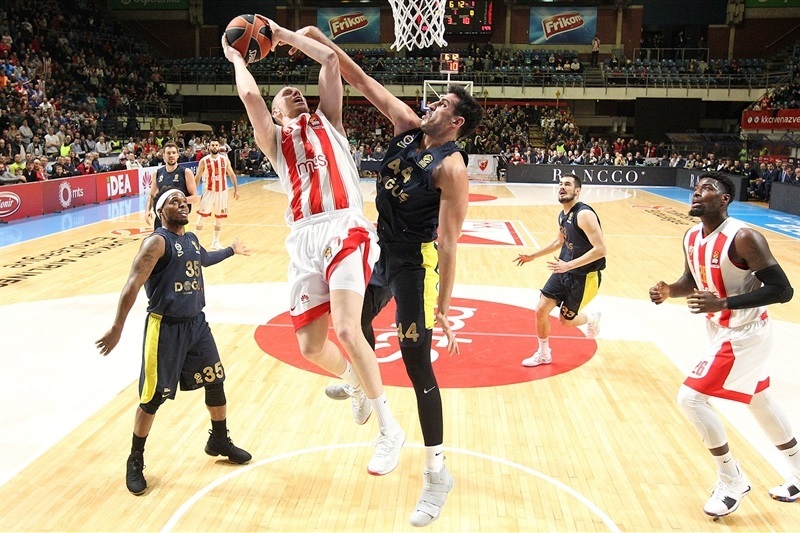 Nikola Kalinic followed with 10, while Jan Vesely and Marko Guduric scored 9 each. Altogether, six Fenerbahce players combined for 14 of 24 three-point shooting, or 58.3%. 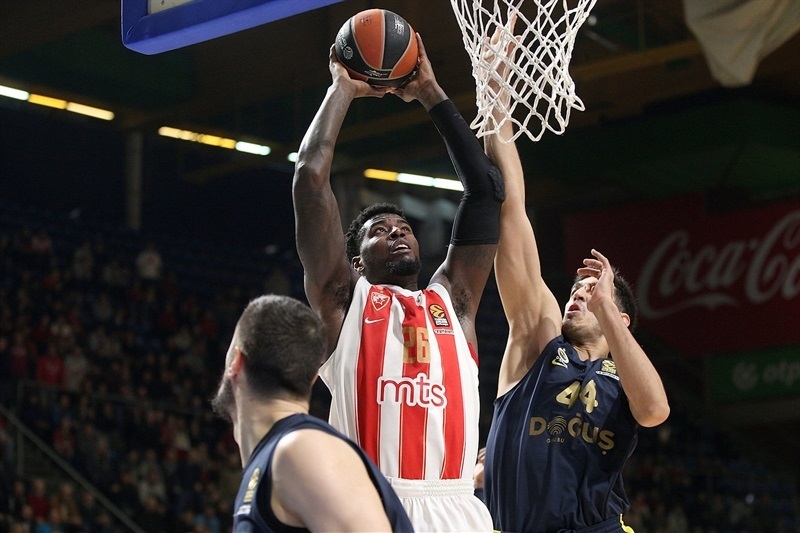 Dejan Davidovac had the best scoring game of his rookie season with 18 points for Zvezda, for whom Dylan Ennis was the only other double-digit scorer, with 10. 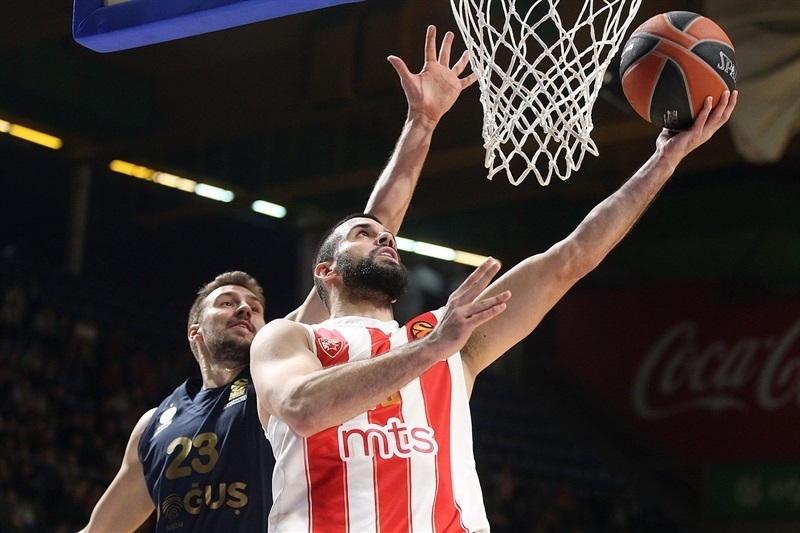 Single free throws by Mathias Lessort of Zvezda and Kalinic opened the scoring before Vesely broke away for a slam and Branko Lazic downed a reverse layup for the home team. Muhammed's first triple and his fastbreak layup preceded a one-hand alley-oop dunk for Vesely, giving Fenerbahce a sudden 3-10 advantage. Davidovac responded with a three-point play before he and Muhammed traded triples at 9-13. Guduric got his first points from deep, Vesely added a free throw and Muhammed drilled another triple to make it 9-20. 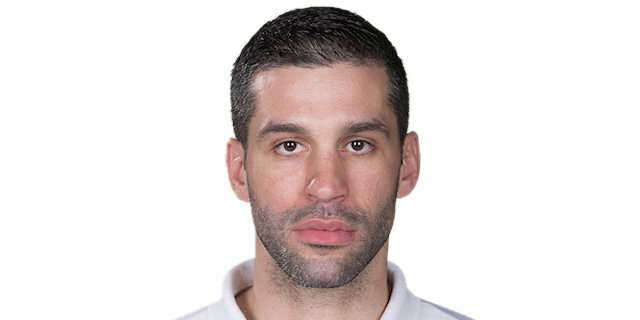 Ennis finally broke a Zvezda scoring drought with 8 consecutive points to trim the difference to 17-22 after 10 minutes. A second-chance three-pointer from Nicolo Melli fell before Vesely hit 2 more baskets for another double-digit lead, 19-29. Back-to-back shots in close from Rochestie were met with Brad Wanamaker burying a triple at 23-32. 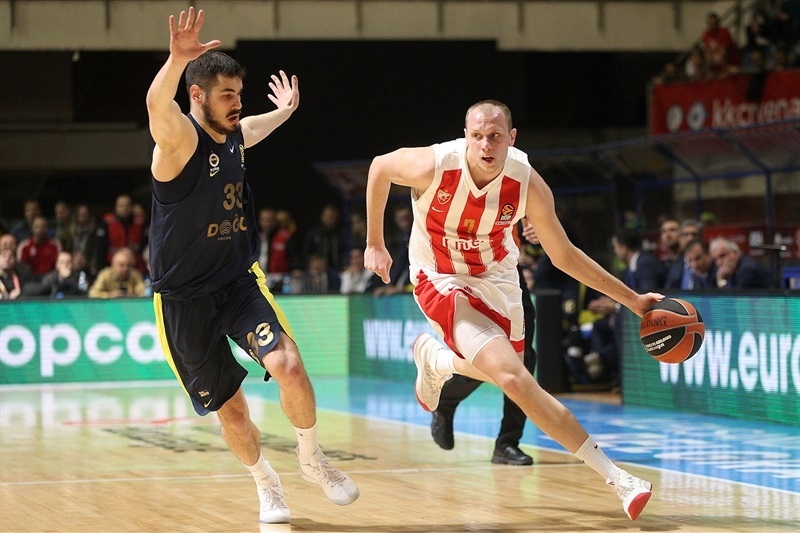 Ognjen Dobric dunked and Alen Omic scored in close to get Zvezda within 27-34. James Feldeine and Wanamaker exchanged layups before Ennis turned a steal into a fastbreak finish that left a 31-40 scoreboard at the break. Muhammed's fourth triple started the second half and then he toed the line for a long two-pointer. He and Guduric connected on 2 more triples as the lead soared to 32-51. 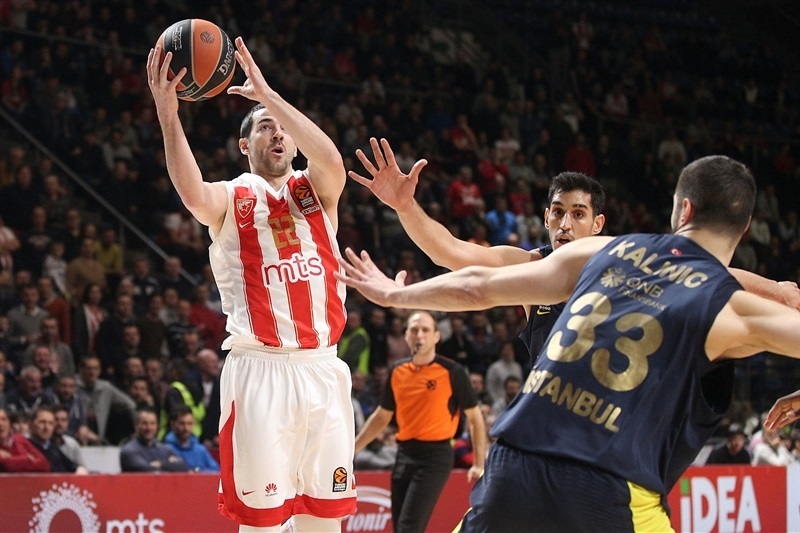 Then it was Muhammed hitting twice more from deep, giving him seven, and Kalinic adding his own as the visitors exploded to a 36-62 advantage. 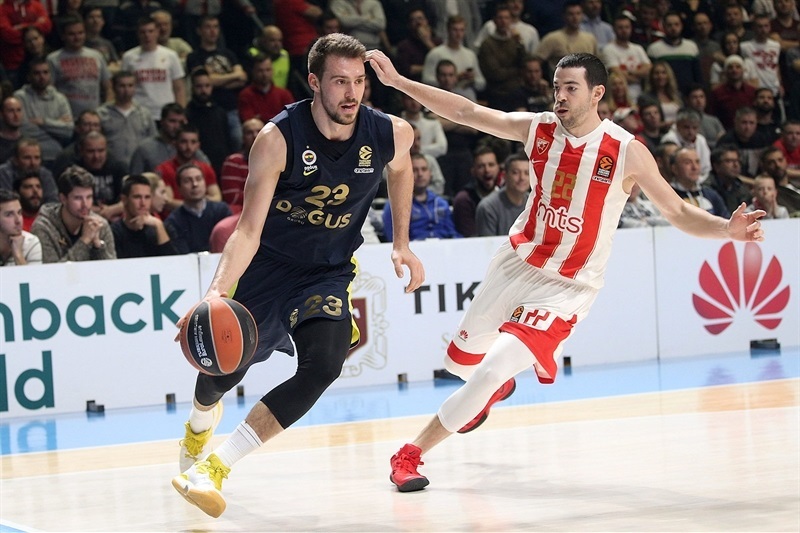 Guduric returned to the arc for the next Fenerbahce triple as the third quarter ended 41-65 for the visitors. Dobric got a corner triple for Zvezda and Stefan Jankovic a shorter jumper for a change of pace to start the fourth quarter at 46-65. 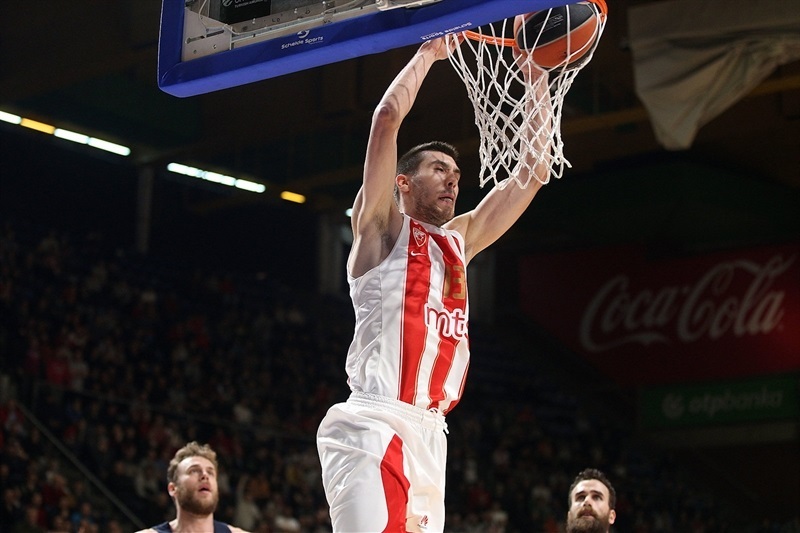 Davidovac converted a steal and slam into a three-point play before Dobric broke away for another rim-rocker at 51-67 to complete a 15-5 run for Zvezda. 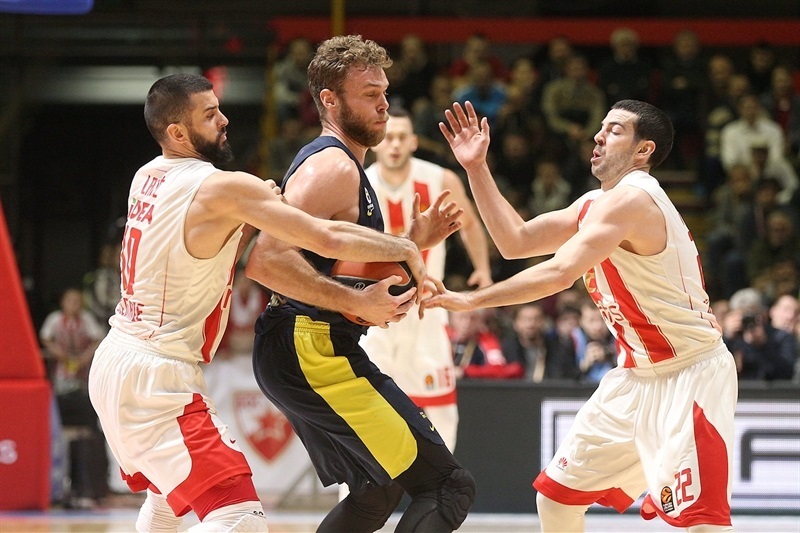 Luigi Datome settled down Fenerbahce but Davidovac and Rochestie kept dropping the difference to 58-71 with under 3 minutes left. That's when Kostas Sloukas answered from deep, although Davidovac matched him. Ahmet Duverioglu's dunk ended the threat as Fenerbahce wrapped up a road win that was worth one of the champs' biggest goals to date, home-court advantage in the playoffs. "I believe the third quarter was key. [Ali Muhammed] shot excellent tonight, shot very good his three-pointers. That wasn't the case in the last two games, but basketball is like that. Congratulations to my players on one more important victory. I believe for some minutes we played good, and it was enough to win this game. We try always to play aggressive on defense and many times our rotation on defense was correct. Our big guys did a good job on switch defense in some crucial moments; they helped the perimeter players. I believe that if we want to be on the level that's necessary we must be even better, because we had ups and downs during this game. In some situations, it was very easy to recognize what we needed to do, but we made turnovers. We have to be more decisive offensively because some players, they are not decisive." 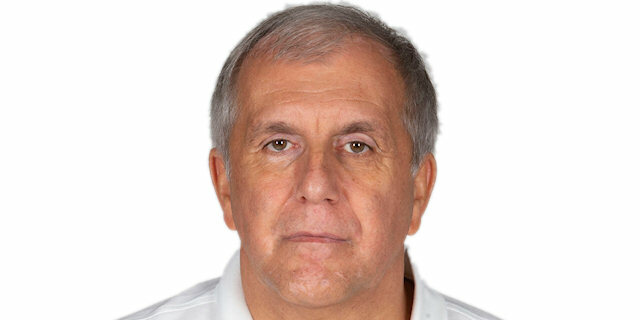 "Every game in the EuroLeague for us is important. We have two more and we'll try to play those two games in front of us well to see which position we'll be in for playoffs. It's important for everybody to be healthy and to be in good shape before the start of the playoffs." "It was a team effort, guys were finding me and I was able to make some shots. I caught a rhythm; basketball is a rhythm game, you know. We got a big lead in the third quarter and we were able to hold them off and finish the game in the end."